This study reviews the nature and outcomes of policies, incentives and management procedures in the Namibian hake industry from independence in 1990 to the present. It is argued that, although based on individual quotas, Namibia’s post-independence management procedures have conflicted with the State’s commitment to efficiency. Its ‘Namibianization’ policy and its attempt to increase domestic control of the hake industry both increased fishing effort and depressed hake stocks below economically optimal levels. Despite current over-capacity, government continues to reward new investments. Industry inefficiency has been further compounded by inconsistent rights allocation policies and the fragmentation of quota shares, which have reduced right-holders’ sense of stewardship over the resource. If the resulting loss of rents is to be reversed, the present policies and the associated perverse incentives will need to be re-evaluated. Managing a fishery is a complex process with social, economic and ecological dimensions. Without regulation, open access and modern technology can cause an economically excessive effort level and an unwarranted decline in the resource. Increasingly, modern managers have seen the solution in twin policies: the allocation of property rights, often in the form of individual tradable quotas (ITQs), and rule-based management of the TAC (total allowable catch) through operational management procedures (OMPs). This usually makes a public authority responsible for the sustainable utilization of the resource and its socio-economic consequences. This paper shows how institutional factors can lead to poor delivery in a theoretically valid “rights based” management system. Like many third world countries, Namibia faces competing imperatives. Job creation, food security, foreign exchange generation and tax revenue collection are only a few. The job of a politician is to balance these. By contrast, the fisheries scientist often looks to the long-term sustainability of the stock he or she studies, and measures success by the growth of that resource. There is no right and wrong in these two approaches; but behind both of them lies a simple reality: the sustainability of the resource is key to all. If the stock collapses, with it go the jobs, the foreign exchange and the tax revenues. No short run imperatives can overide this harsh reality. This paper explores the divergencies between scientific and political management in Namibia, and their implications. It is structured as follows: the initial portion, sections one and two, provides background material. The former details the problem of managing a fishery when the manager has multiple objectives in mind, and the special problems faced by Namibia’s fisheries managers. Section two addresses the institutional history of the Namibian hake fishery. The later portion analyses the impacts of these divisions Section three describes the process of resource management, including the development of scientific recommendations and their evolution into political decisions. Section four discusses the implications of these divergences, and section five concludes. It is in the interest of any nation that the its fisheries’ resource rents (i.e. the fishing industry’s economic profits) be maximized and captured locally. That this is rarely achieved has been clearly shown (World Bank, 2008), despite the fact that most fisheries management regimes have long moved from open access policies to various forms of effort control. Such controls include restrictions of catch, gear, effort, area or season, the impacts of which are on the resource directly, and also economic interventions including fishing rights, licence fees and taxes. All aim to reduce economic inefficiencies and to increase the overall profitability of the industry. However, in their original forms all proved inefficient. In each there remained a fault line between individually rational behaviour and the ideal behaviour that would maximize collective profits. Economic theory suggested that allocating property rights to the resource could solve the problem. Each right would be issued as an individual quota (IQ) i.e. a fixed proportion of the annually set total allowable catch (TAC). Such rights remove the incentive to race for fish before the TAC is fished out. Fish prices stabilize as fishers spread their activities over longer periods, and the incentive to overcapitalize is removed. At the same time, the TAC is still operating to ensure the long-term sustainability of the resource (Grafton 1996; Sumaila 2010). If rights can be freely traded as individual transferable quotas (ITQs) they will in time be held by the fishers best able to profit from them. In this way sustainability and rent maximization are theoretically achieved simultaneously. The issue becomes less clear-cut if the state’s objective function also includes job creation. In theory government can tax away the (maximized) profits of the fishing industry and use them to create jobs at low cost elsewhere in the economy. Alternatively they can pressure firms to use uneconomically labour-intensive technologies, thus trading off the number of fishery-related jobs per tonne of fish captured, against profits. Clearly, if job creation is important, then the selection of stategy should depend on the state’s (in) ability to create jobs cheaply elsewhere in the economy. The second requirement for policy efficiency is the accurate determination of the TAC which sets the tonnage in each individual quota. This requires credible scientific stock assessments, and a recognized rule tying the TAC to them. This system increasingly takes the form of an OMP: a set of rules pre-agreed between the industry, scientists and the state, based on a statistical catch-at-age model of the fishery which is updated regularly to provide stock estimates. The model can (and should) be regularly improved, but critical to the operation of the process is a commitment to follow its prescriptions. Namibian fisheries are often held up as an example of well-conceived management. Management plans (OMPs) have been in place for over a decade and the state appears supportive of scientific management. A closer study, however, shows a history of inefficiency, much of it based on TACs set above the levels originally recommended. In part this has flowed from the prevailing institutional arrangements, though some can be traced back to early failures in the model driving the OMP, which reduced the credibility of the science involved. This paper investigates these inefficiencies and their roots. Prior to independence in 1990, Namibia was administered by South Africa through a League of Nations mandate. In consequence, even after the 1982 Convention on the Law of the Sea, the territory’s waters extended only 3 nautical miles, beyond which there was effectively open access. Unsurprisingly, the hake resource which the new Namibian government inherited at independence in 1990 had been seriously depleted by foreign fleets. Responding to this problem the State imposed a variety of imperatives on itself: one of these was to establish the fishery as a domestic activity. Another was to allow the resource to recover to levels that would maximize resource rents. These two objectives have proven mutually incompatible. Indeed, despite strong constitutional language mandating sustainable management, the resource has continued to be over-exploited. This paper explains the policy choices made and their consequences. It has been argued that key to the sustainable management of a fishery are the institutional structures and incentives facing its participants (Hilborn et al. 2005). Since independence, the Ministry of Fisheries and Resource Management of Namibia has been responsible for the management of the country’s ‘publicly owned’ hake resource. State policy entitles the industry to a ‘normal profit’, but requires that any further ‘economic profits’ should accrue to the people as a whole, the government being responsible for their collection and distribution. There is no doubt that the resource was severely depleted at independence and had to be allowed to recover. This process was, and continues to be, poorly managed and as a result potential rents were lost. The extent to which Namibia’s post-independence hake fishery’s resource rents fell short of their potential, and thereby imposed costs on both the industry and the public, has been estimated by a range of authors (Manning 1998; Oelofsen 1999; Ithindi 2003; Lange 2004). Manning (1998): 270 argued that the hake industry lost rents of N$260a million in 1996, while we estimate that rents with a minimum value of N$227 m were lost in 2010. The statement seems clear. At Namibia’s Independence in 1990 the fish stock had been seriously depleted by foreign fishing fleets, the domestic fishing industry was poorly developed, and fisheries provided little employment to Namibians. The depleted stocks called for conservative management if they were to rebuild to a rent-maximizing level. However, this long term imperative was countered by the immediate need to develop the local fishing industry and to increase employment. Twenty years have passed since these objectives were formulated and implemented. The estimated hake stock was then far below its maximum sustainable yield level (BMSY), and despite some comments in the literature (e.g. Nichols 2004), the resource has not recovered since then (Kirchner et al. 2012). Although the system of individual rights used by the Namibian authorities should have enhanced the efficiency of the hake fishery, lowering costs, reducing effort, and rewarding the industry for allowing the recovery of the stock, it has signally failed to achieve these ends. Much of this failure is owing to institutional features of the industry and the state management system that directed it. The central institutional driver has been “Namibianization”. The government has consistently espoused the view that the country’s citizens should share the benefits of its natural resources. One manifestation was the Namibianization policy of 1992 gave citizens economic incentives to participate in the fishing industry as owners or as employees (Armstrong et al. 2004). The policy had two objectives: increasing Namibian control/ownership, and increasing economic benefits to Namibians. The former entailed achieving Namibian majority shareholding in fishing companies, while the latter promoted job creation for Namibians and revenue generation for government (Erastus 2002: 43). The policy led to the termination of all pre-existing fishing rights in 1993, and the allocation of new rights using the degree of Namibian control in applicant firms as the primary criterion.a Firms with less than 50% Namibian ownership received seven-year quotas, while those that were at least 90% Namibian-owned, and had 50% Namibian investment in vessels and onshore processing facilities, received fifteen-year rights. Namibian right-holders with part shares in larger ventures, and foreign-owned ventures that had invested significantly or had the potential to do so, also qualified for 15-year fishing rights. 20-year rights were ostensibly available to ventures that employed at least 5 000 permanent employees in onshore processing facilities and fulfilled the requirements for 15-year rights (Armstrong et al. 2004), but none has yet been allocated. Melber (2003) has claimed that almost all levies were paid at the lowest rate and that Namibianization was and is illusory, with foreign control maintained through a complicated web of preferential shares, proxy ownership and cross-ownership (Manning 1998; Melber 2003) that lowers the State’s share of resource rents. In addition to the quota levies and the standard corporate tax fee of 35%, companies pay by-catch fees on most non-quota species. Although most fetch lower prices than hake, two species are particularly valuable, Monkfish (Lophius vomerinus) and Kingklip (Genypterus capensis). The fee is intended to prevent the targeting of these species without encouraging by-catch dumping. Some by-catch is allowed without payment since an element of it is unavoidable (Nichols 2004). Namibia prohibits vessel to vessel transhipment of fish. Consequently, all hake is landed at Walvis Bay or Lüderitz, where onshore inspectors monitor compliance with quota limits and fee payments (Nichols 2004). All hake vessels also carry onboard compliance monitors. The final fee is that paid into the Marine Research Fund for every tonne landed. During the period 1994–1999 the fund collected an annual average of N$37million for research and training (Wiuum and Uulenga 2003), the hake sector typically contributing 56%-66% of this (Eide et al. 2003). to provide the newcomers with enough quota to compete against well established companies (Erastus 2002). to increase employment: the quotas were distributed with the proviso that the fish be processed ashore, as onshore processing is more labour-intensive than that aboard freezer trawlers (Armstrong et al. 2004). Unfortunately, the high cost of entry into the industry encouraged some new right-holders to ‘lease’ their quota to established firms. An average wet-fish vessel at the time cost roughly N$7.7 million (about N$55 million in 2011 terms) and, while cheaper than freezer vessels, which then cost about N$26.5 million (roughly N$100 million or US$8 million in 2011 terms), it was still costly enough to make it difficult for newcomers to buy their own vessels (Japp and Steenkamp 2004). The Namibian authorities were concerned that new recipients of quota should not simply sell their quota and pocket the cash. Consequently a feature of the Namibian hake fishery is that individual rights are technically non-tradable; however, the acceptability of leasing arrangements has rendered them de facto ITQs (Armstrong et al. 2004). Importantly, this official non-tradability precludes the use of quota as collateral when applying for credit (Sherbourne 2010). In 2002, the Minister of Fisheries announced that foreign companies wishing further exploitation rights would need to form joint ventures with previously disadvantaged Namibians. Although some new right-holders had already bought old vessels (thereby reinforcing industry over-capacity), some foreign firms objected that Namibian partners in such joint ventures would be more likely to decamp with their share of the money than to invest it in maintenance or acquisition of assets (Melber 2003). While the employment creation aspect of Namibia’s empowerment policy appeared successful during the period 1991–1998, when fisheries employment increased by 6 000 (Erastus 2002), it was not costless. Armstrong et al. (Armstrong et al. 2004) estimated that between 1993 and 1998 the policy provided 1000 new jobs a year at an average annual cost of N$74.5 million in quota fees foregone: a cost to government of N$74 500 per job. Manning (1998) asserted that the funds could have been used more effectively in other sectors, such as health, education and housing. He critiqued the Namibianization policy on three primary grounds: general loss of resource rent, the capture of resource rents by a few individuals rather the Namibian people as a whole, and the continuation of de facto foreign ownership. In a rejoinder, however, Oelofsen (1999) contended that, compared to other national fisheries, Namibia had captured a relatively large part of the resource rent. Undoubtedly, Namibian ownership has increased substantially since independence, as has participation by Namibian pension and insurance funds. Fishing rights lie at the heart of Namibian fisheries policy: ‘No person may harvest any marine resource commercially unless they are the owner of a fishing right’ (MFMR 2000). Such rights are primarily intended to curtail fishing effort, and protect the resource (Nichols 2004), however redistribution is an important secondary aim. Sections 16, 17 and 18 of the 1992 Sea Fisheries Act (Government of Namibia 1992) specified that the applicant should be a Namibian citizen or company, and should be able to exploit the resource satisfactorily. To this it was added that special criteria such as the advancement of previously disadvantaged persons and the contribution to regional development in Namibia would be considered, and that the rights would be non-transferable to ensure that the Namibianization and empowerment strategies were sustained (Nichols 2004). Unfortunately, Namibianization further fragmented the TAC. Owners of quotas too small to warrant vessel purchase either leased them or entered into joint ventures with larger quota holders. The resulting power asymmetry often meant disadvantageous commercial relationships (Manning 1998), the rents being captured by the larger firms with whom they interacted. Such fragmentation also affects sustainability and rents. In an oligopolistic fishery with long-term rights, firms have an incentive a) to steward the resource properly and abide by the quota set (no highgrading etc.) and b) to set up processing plants and establish markets for processed product, i.e. to add value (Parslow 2010), since the economies of scale and scope in hake processing and marketing allow vertically integrated firms to make fuller use of value chains. However, as Sumaila (2010) pointed out, when those who have long-term quotas are not those doing the fishing, ITQs are no guarantee of good resource stewardship. One flaw in the current quota allocation system is that it engenders perverse incentives. The Ministry of Fisheries expects unfilled quotas to be returned for redistribution to other companies. Right-holders that do not return uncaught quota are penalized N$800 per tonne for uncaught quota (no rebates). The Ministry has also warned that unfilled quotas might affect future rights allocations (Armstrong et al. 2004). This puts pressure on quota-holders to keep fishing even when catch per unit effort (CPUE) is low.d This is clearly at odds with the stated primary objectives of Namibian fisheries management and seems likely to deplete both resource stocks and company profits (BCLME 2006a: 32). The allocation system not only fails to maximize rents, it fails to appropriate them to the state. One suggested solution is auctioning the quotas to eligible bidders, granting the quota to the second highest bidder to disincentivize over-bidding by new entrants (BCLME 2006b: 90). The key failing of Namibia’s hake policy has been its inability to restore the resource. Although the Namibian hake population showed some recovery after 2007, it remains at one-third of the modelled maximum sustainable yield level (BMSY) (Kirchner et al. 2012), a level similar to that in 1990. One reason for this failure is that Namibia’s fisheries managers are juggling competing economic, social and political imperatives. While high catches may be politically useful, they only make economic sense if interest rates are very high, catch per unit effort (CPUE) is unrelated to stocks, or an easily-poached high-value resource is involved. This failure has had profound consequences for the fishery’s viability. Ordinarily, maximizing the present value of fishery profits requires keeping the resource large enough to provide a high future CPUE, thereby keeping average costs relatively low (BCLME 2006b). The age distribution of the fish population is also affected by current catches: overfishing leaves a younger stock of smaller individuals. It also affects product prices; rebuilding the resource increases the proportion of older and larger fish in the catch. These command a higher price per kilogram, typically 200 to 300 percent more than small hake (Leiman and Harris 2009: 42). Since larger fish are also more fecund, allowing an overfished stock to age will clearly increase sustainable rents. It is worth re-emphasising that rents in the hake sector increase along a value chain. They accrue to those processing hake rather than to those harvesting it. Large vertically-integrated fishing companies enjoy economies of scale and scope. Not only are they more cost-effective, but their wider spread of processed products reduces their vulnerability to financial risk and leaves them better prepared for quota and economic fluctuations. Such firms exist in a world of long-term contracts with international buyers and necessarily take a longer-term approach to the sustainability of the fish resource (BCLME 2006b). In evaluations of profitability in the hake sector, an issue that regularly appears is the “wet-fish/freezer vessel debate”. At its heart is job creation. The hake fishery currently employs 63% of all fisheries workers. A key determinant of employment levels is the harvesting method used. Redistributing quota to wet-fish operators lengthens and adds complexity to the value chain, increasing the range of product options. It also increases employment of unskilled and female labour (the restricted range of hake products produced aboard freezer vessels is largely produced by semi-skilled male labour (BCLME 2006a)).e To increase and secure employment in the sector, the Ministry of Fisheries has therefore given wet-fish trawlers about 70% of the TAC, though the industry has typically argued that freezer trawlers (the remaining 30%) are more profitable (Japp and Steenkamp 2004), and that State support of the wet-fish sector is dissipating taxable resource rents (BCLME 2006b). Freezer vessels can only make limited use of large (high-value) fish since these are mechanically filleted and used to produce a limited range of standard products. If landed from a wet-fish vessel the same fish could be exported fresh, hand filleted, or processed into a designer product aligned to immediate market demands (BCLME 2006a). On the other hand, Namibia’s wet-fish trawler fleet is very old (over 30 years); vessel efficiency deteriorates with age, potentially dissipating rents further (BCLME 2006c). It is politically difficult to reduce overcapacity in a fleet (Oelofsen 1999), even when it is clear that vessel age and fleet overcapacity directly dissipate rents. Namibia’s problem has been worsened by a quota allocation process (Government of Namibia 1993) that encourages investment in vessels and processing plants by tying additional quota allocation directly to capital investments made. The Namibian government’s 1994 apportionment policy (BCLME 2006c) aimed to increase employment in the fishery by gradually shifting catch and effort away from the freezer fleet, which dominated the industry in the early 1990s, and towards wet-fish vessels. The policy stipulated that the proportion of the total allowable catch (TAC) going to wet-fish operators would rise from 20% in 1993, to 40% in 1994, 60% in 1995, and the present 70% of TAC. The apportionment policy’s impacts on rents have been disputed (Sumaila 2000, 2001; Japp and Steenkamp 2004). 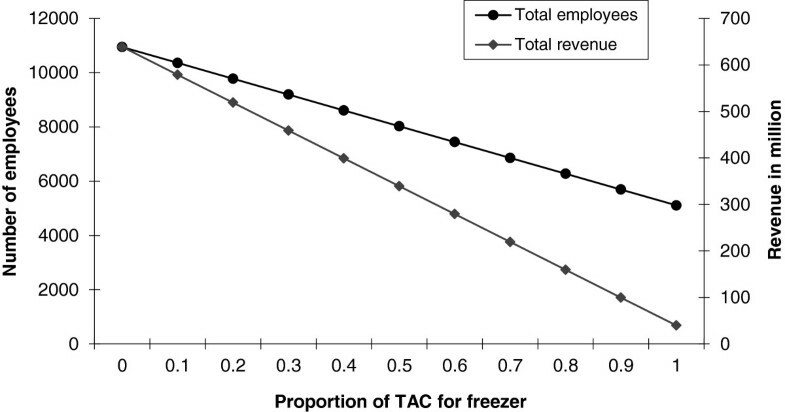 Sumaila (2000), assuming a 150 000 tonnes TAC, assessed the optimal freezer/wet-fish vessel mix in terms of discounted net benefit and impact on employment. It estimated a present value of N$10.42 billion from the 60:40% policy, this coming from 32 wet-fish and 13 freezer trawlers. Controversially, however, it found that the total rent would be greater (NPV = N$11.69 billion) if all the TAC were allocated to 53 wet-fish trawlers, an approach which could provide employment for 7 800 workers as opposed to the 5 219 employed with the 60:40% policy. Sumaila’s later bio-economic modelling results (Sumaila 2001) reasserted that resource rents would be maximized if wet-fish operators received the entire quota. He did concede, however, that other considerations (biological, market, harvesting and processing constraints) could support the current allocation system. Sumaila’s results were contested by Japp and Steenkamp’s (2004) study of detailed revenue data from 13 land-based factories, 20 freezer vessels and 77 wet-fish vessels for the 2002/3 fishing season. Although some wet-fish operators were profitable, they found the wet-fish segment of the hake fishery generally unviable. They estimated the net present value for freezer vessels at N$363.3 million in 2004 while wet-fish operators showed a loss of N$2 466 million. While revenues per tonne were similar, the combined fishing and processing costs per tonne on freezer vessels were below those of fishing with wet-fish trawlers and processing on land. Consequently they recommended a controlled deregulation of the apportionment over four years. The relative profitability of wet-fish vessels is clearly affected by fuel prices and the distance vessels have to travel to their fishing grounds. Freezer trawlers do less travelling, but have to generate their own power on board. Japp and Steenkamp’s (2004) study was undertaken after oil prices had begun their rise.f However, Eide et al. (2003) estimated hake resource rents between 2000 and 2002 (a period of low fuel prices) at N$81-140 million for wet-fish operators and N$171-234 million for freezer vessels, despite their smaller share of TAC. The remainder of this paper will evaluate the management of the resource by comparing the policy recommendations made to those actually adopted, and their consequences. The revenues lost through quota fee reductions were calculated and the impacts of apportionment policy were investigated using a bioeconomic model (Kirchner 2014 forthcoming). First a working group that contains industry members, government scientists and consultants, meets to discuss the available data and the assessments. On the basis of these discussions government scientists then prepare recommendations for the annual hake TAC and related issues. These are then presented to the Minister and senior officials. At this stage they may be changed. The recommendations are next put to the Marine Resources Advisory Council. They take cognizance of socio-economic considerations and formulate their own recommendations for the Minister, who receives them and then himself makes recommendations to Cabinet, taking into account any other relevant factors. Immediately following Independence, a hake TAC of 60 000 tonnes was allocated for both 1990 and 1991. This was a severe drop: catches had been around 300 000 tonnes in 1989. Between 1992 and 1997, the scientists’ TAC recommendations were based on swept-area research surveys taken to estimate the hake biomass. It is important to note at this stage that the Namibian White Paper on a Marine Fisheries Policy (Government of Namibia 1991) recommended that TAC be restricted to 20% of the “fishable biomass” (fish larger than 35 cm) until the stocks were considered rebuilt. This guideline was not always followed, as for example in 1995, when the scientifically recommended TAC was about 35% of the fishable biomass, which was further increased by Marine Resources Advisory Council (MRAC) to over 40%. One source of the problem was scientific uncertainty. The pre-1990 data were of mixed quality, making it difficult to set a baseline. By 1997, the status and trend of the hake resource remained unclear. While the catch per unit effort (CPUE) index was declining, the survey index estimate showed no trend at all (Butterworth and Geromont, 2001), implying that the stock was stable. The ambiguity came from the effect of prior assumptions on the outcomes of the swept-area survey estimates. These estimate the biomass of fish aged 2 years or more as a proportion of the estimated pristine stock of such fish (B2+/K2+). If treated as an absolute, (i.e. one was implicitly assuming that the gear was 100% efficient with a catchability coefficient q = 1, and that the survey estimates were unbiased), then the surveys suggested that the stock was depleted to B2+/K2+ = 0.104h. But if the survey estimates were treated in relative terms, then the resource could look very healthy. Thus, if the assessment used a catchability coefficient of q = 0.2 (implying that only 20% of the fish in the path of the trawl were being caught) then the resource appeared very healthy (well above BMSY with B2+/K2+ = 0.803, indicating that higher TACs could be set. In reaction to this uncertainty Butterworth and Geromont (2001) developed an “Interim Management Procedure” (IMP). This aimed to prevent the resource being left unharvested if it was in good condition while allowing the resource managers to react fairly quickly if subsequent data indicated that the stock was indeed depleted. Although the IMP was in place from 1998 to 2000 its recommendations were never followed, either because scientists changed the original formula or because the MRAC disputed its recommendations. A new operational management procedure (OMP) was tested and internationally reviewed (unpublished reports of the BENEFIT stock assessment programme 2000, 2001). It appeared to perform reasonably well provided the carrying capacity of the hake stock did not decrease, even when the survey estimates were taken as absolute (the most pessimistic case) (Rademeyer 2003). The hake OMP had been developed to meet four objectives: to maximize average annual catch; to minimize annual catch variation; to allow recovery in spawning biomass to at least the MSY level; and to achieve acceptable risk. Although these matched the stipulations of the Marine Fisheries Policy, the OMP was not accepted by Namibian management and MRAC, and a TAC of 195 000 tonnes was set. Despite the low fuel prices at the time, and the penalties for failure to land quota, only 156 000 tonnes were landed in 2002. The fish stock had clearly been seriously depleted. A routine updated assessment was done to evaluate whether the resource status remained within the range considered when the OMP was developed (Rademeyer and Butterworth, unpublished report 2003a). The updated assessment included new data which changed the results considerably from the OMP reference assessment. Although the estimated depletion value had fallen to 20% for the reference case, it was still just within the 95% confidence intervals for the OMP reference case and the OMP was retained as the basis for recommendations. The recommended TAC for 2003, based on the OMP and following all the rules, was estimated to be 176 000 tonnes. The decrease in the TAC should have been larger, but it was limited by the OMP’s constraint rule which only allowed a 10% year on year decline in TAC. The allocated TAC was 180 000 tonnes, and subsequent reconciliation showed an actual catch of 189 000 tonnes. In 2004, the routine updated assessment for the Namibian hake resource (Rademeyer and Butterworth, unpublished report 2003b) showed a completely different picture to the Reference Case used to test the candidate OMPs in (Rademeyer 2003). It had moved outside the range tested in the OMP; moreover, a statistically significant inconsistency between the survey and CPUE index was detected which had to be addressed in the assessment and recommendations. Though the OMP had recommended a TAC of 158 000 tonnes the TAC was increased from 180 000 to 196 000 tonnes. Yet again the depleted stock prevented the TAC being caught, and only 174 000 tonnes were landed. In 2005, the scientists agreed that the resource was seriously depleted, the modellers (Rademeyer and Butterworth, unpublished report 2005a, 2005b) estimating that the spawning biomass was below 10% of pristine levels (Bsp(2005)/Ksp <0.1). Despite this agreement, government scientists recommended a TAC of 160 000 tonnes, which was increased by MRAC to 180 000 tonnes of which only 141 000 tonnes could be landed. In 2006, it was clear to all that the hake stock was severely depleted. The CPUE was low and the fish sizes were small, suggesting that the biomass consisted mainly of recruits from the above-average 2004 and 2005 cohorts. Many companies in the fishing industry suffered extreme financial strain and some closed. The assessments indicated that the TAC should be decreased to at most 100 000 tonnes and then kept low for many years for the resource to regain the MSY level. The industry requested step-wise reduction in the TAC so that members could adapt their businesses to lower quotas. It was therefore recommended that the TAC be reduced to 140 000 tonnes in 2006 and then cut by 10 000 tonnes annually for four years, to reach TAC of 100 000 tonnes in 2010, where it would stay until the resource had expanded to the MSY level. However, the severity of the situation was so clear to management members and MRAC that TAC was cut by 50 000 tonnes and set at 130 000 tonnes. There was general concern that large numbers of fish smaller than 36 cm (the official minimum size) were being landed despite the use of compulsory sorting grids. To address the problem additional regulations were implemented. Those implemented in or by 2006 included an increase in the minumum mesh size to 110 mm; the closure of the fishery in October of each year, and a series of geographic restrictions that precluded hake fishing by wet, freezer and longline vessels within the 200 m waterdepth range along the whole Namibian coast, and more specifically no trawling in waters shallower that 300 m the area from 25°S to the Orange River, and no freezer trawlers between 25°S and the Orange River in waters shallower that 350 m.
Despite the earlier commitment, the TAC was never decreased to 100 000 tonnes. It remained at 130 000 tonnes until 2008. The resource showed some improvement in 2009 and the TAC was increased to 148 000 tonnes to help the fishing industry through the worldwide economic downturn. Possibly due to above average recruitment levels in recent years (Kirchner et al. 2012), the resource showed clear signs of improvement, therefore the basis of scientific advice was revisited in 2011. The recommended TAC is now set at 80% of the average replacement yield over the previous five years, with 20% being left to expand the resource. Despite recent experiences, even though the recommended TAC for 2011 was 145 000 tonnes, 180 000 tonnes of quota were allocated, with 170 000 tonnes being allocated for the 2012/2013 season. Namibia’s fishing season starts in May and ends in April of the subsequent year. 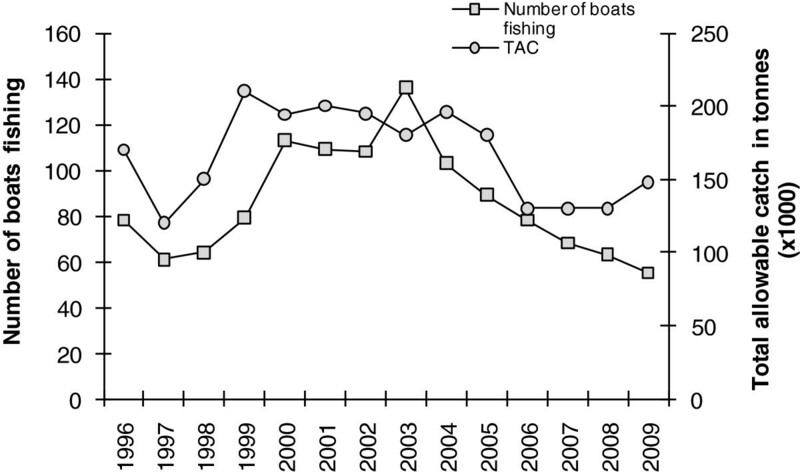 In most years more vessels were licensed than actually fished, although between 1996 and 2002 unlicensed (or poorly recorded) vessels were fishing, especially in the freezer sector (Figure 1).Initially, the number of trawlers was closely tied to the TAC; however, since 2006 vessel numbers have decreased despite an increasing TAC (Figure 2). Two reasons suggest themselves: a) that, despite the non-tradability of quota, industry members have aligned themselves through joint ventures etc. allowing more efficient use of capital, and b) that with rising oil prices only the most efficient vessels are being used. 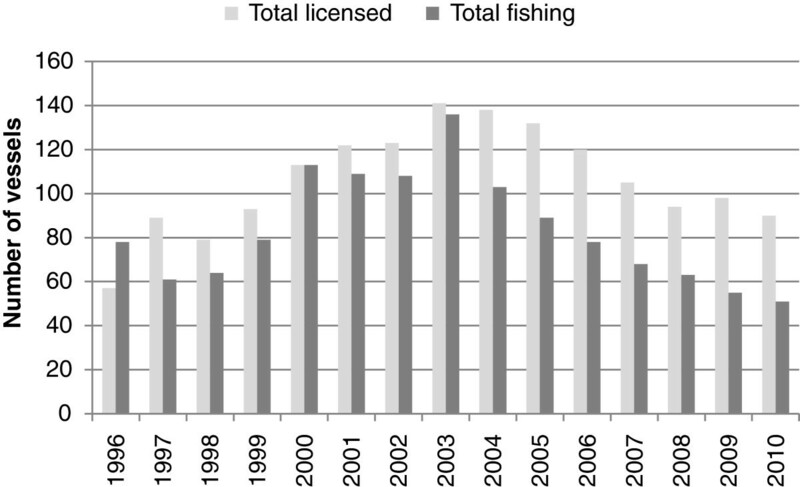 Number of vessels licenced and fishing: 1996–2009. Number of freezer and wet-fish vessels fishing and total allowable catches (in 000 s tonnes): 1996–2009. Excess capacity was clearly a significant issue. The catching capacity of the 63 vessels actually fishing in the 2008 fishing season (May 2008 - April 2009) was estimated at 205 000 tonnes, 137 000 tonnes for wet-fish and 68 000 tonnes for freezer vessels. However, the TAC was only 130 000 tonnes and 31 vessels were not fishing at all. With October closed for fishing, and allowing a typical fishing trip of 7 days with 3–5 days in the harbour between trips, an efficient wet-fish vessel could potentially be fishing 195-230 days per year. Only 32% of the wet-fish fleet fished 200 or more days in the 2008 season, while 32% were out for fewer than 150 days. Freezer vessels spent typically 200–240 days fishing in 2008. The number of hours trawling per day was estimated at 13 and 16 hours for the wet-fish and freezer fleet respectively. A priori, both vessel efficiency and CPUE are linked to engine power. However, this appears to explain only 12% of the variation in CPUE (Figure 3a). On the other hand, if two right-holders whose vessels had persistently lower-recorded CPUEs are removed from the dataset, variations in engine power explain 27% of the variation in the CPUE (Figure 3b). Horse power (HP) related to catch-per-unit effort (CPUE) for the entire wet-fish fleet (a) and a subset of the wet-fish fleet (b). Vessel age may also be tied to efficiency, a concern given that 54% of wet-fish vessels are more than 30 years old. However, it was found that vessel age was not a significant determinant of CPUE. There are 38 right-holders in the hake industry, ten of whose rights were renewed at the end of 2010. In addition, the Minister of Fisheries called for additional fishing rights applications so as to spread the rewards of the industry more widely. Though quotas are ostensibly non-transferable, they can be leased or used in joint ventures. Most right-holders receive both freezer and wet-fish quota even though the majority have no freezer vessel. The current system of rights distribution is clearly costing the state money. Although the right-holder initially pays N$300 and N$550 per tonne for wet-fish and freezer quota, respectively, these can subsequently be “leased” for between N$1000 and N$1500 per tonne per annum for the wet-fish quota and double that for freezer quota. This means that a right-holder who receives 2% of the current TAC (140 000 tonnes), with 200 tonnes being freezer quota and 2 600 tonnes wet-fish quota, can pocket N$2.86 million (before tax) in a year. If the entire quota were auctioned, at the prices quoted above it would be worth an additional N$227.5 million to Government. In an efficient market setting, this amount, plus the application fees, would be the minimum expected resource rent for hake. In 2010 the quota distribution across right-holders was as follows: 19 right-holders (50%) received quotas comprising 2% or less of the TAC. The right-holder receiving the highest quota (13.43%) received nearly as much as the 13 right-holders who received the lowest portions (13.94% jointly). Despite the industry’s excess capacity, right-holders are rewarded for making investments by being awarded once-off increases in quota. An unallocated share of the TAC is maintained for distribution at the Minister’s discretion. The Minister has allocated ailing companies additional quota, but the quota system is effectively a zero sum game. If the additional rights come from the Minister’s reserve there is a stock externality; if not it decreases every other right-holder’s portion. Figure 4 illustrates the difference between the pro-rata allocations in the 2009 fishing season and those given in 2010, excluding any quota allocated from the reserve. If the pro-rata allocations were consistent from year to year, the difference would be zero. It is clear that some right-holders’ portions of the pie increased while others decreased. This is in contrast to the theory underlying the IQ system, where the proportions of the TAC should remain constant from year to year (Sumaila 2010).That quota fees were in reality lower in 2011 than in 1997 reflects the economic hardships that the hake industry faced. If, however, with a healthier stock, the quota fees had increased by 5% per annum since 1997, the government could have collected an additional N$630 million (see Figure 5). On the other hand, this might have prompted the rationalization of the hake sector into a few large vertically-integrated oligopolistic firms. Difference between pro rata quota allocations in 2009 and 2010 fishing seasonsacrossall 38 right-holders. Actual (budgeted) quota fees and hypothetical quota fees allowing annual inflationary increase of 5%. Kirchner’s 2010 economic survey (Kirchner 2014, forthcoming) showed that financial returns in the freezer sector exceeded those in the wet-fish sector (N$700 vs. N$531 profit per ton), supporting Japp and Steenkamp’s (2004) findings. However, the wet-fish sector could be the better performer were its fleet consolidated and streamlined (Figure 6). An evaluation of the apportionment policy was done using economic industry values (Table 1) based on a study done by (Kirchner 2014, forthcoming). This changed the number of trawling days from the average to the optimum i.e. to 230 and 240 days per year for wetfish and freezer trawlers respectively. Number of employees and revenue in N$million for the various proportion of TAC for freezer trawlers. “average trawling days” reflects the optimal number of trawling days. As mentioned, 32% of wet-fish vessels currently fish fewer than 150 days a year. Modelling by (Kirchner 2014, forthcoming) suggests that about 77 wet-fish vessels would be needed to catch the current quota. With industry rationalization to remove underperforming wet-fish vessels, awarding the entire TAC to wet-fish right-holders could increase the annual resource rent by about N$180 million and raise employment to approximately 11 000 employees from the present 9 200. Simple data analysis and modelling can illustrate but not indicate the optimal apportionment of technologies. In reality, a mix of technologies gives some insurance against the uncertainties of the real world and allows producers a mix of marketing strategies. Little more than this can be said at present. It is not unusual that scientists’ recommendations for TAC are exceeded by those making the decisions. Short-term political returns often outweigh long-term benefits from resource sustainability. However, Namibia’s government did not face serious electoral risks in the first two decades of independence. Nonetheless, the MRAC consistently over-rode the government scientists’TAC recommendations in the years 1994 to 1997, suggesting either disagreement on the state of the resource, or that the MRAC had a considerably shorter time horizon than its advising scientists. In 1995, government scientists were concerned because the survey abundance estimates had declined from the 1992–94 peaks, as had CPUE. However, the MRAC was arguing that the stock could withstand catches in excess of 150 000 tonnes. Their belief that the crisis was past, and that catches could be safely increased, may have been based on improved survey results and CPUEs after 1990. The disagreements of subseqent years also capture problems with Namibia’s OMPs. A principle underlying management procedures is that all stakeholders adhere to the rules and regulations agreed upon, and abide by the TACs generated. Ad hoc changes to the TAC could affect the OMP’s future effectiveness. If, in 1998, five points of CPUE data had been used (as stipulated in the procedure) instead of the four actually taken, the recommended TAC would have been 120 000 tonnes instead of 140 000 tonnes. Unsurprisingly, government scientists were concerned in 1999 when the IMP recommended a drastic increase from 140 000 to 210 000 tonnes. Had the 1994 CPUE data point been included (as prescribed by the IMP), then the recommended TAC would have been 181 000 tonnes, and had it been followed exactly since 1998, the 1999 TAC would have been 145 000 tonnes and there would have been little cause for concern from the scientists. A management procedure that does not follow its own rules exactly ultimately subverts itself. By 2001 a new OMP had been developed, but Namibian management members did not receive it well. The IMP introduced in 1998 had provided a new approach to calculating TACs. Although its lifetime was set at three years, management members and MRAC insisted on as little change as possible in the annual advice. Although meetings of the working group (including all stakeholders) were part of the process, some management members were unhappy, claiming that industry members, government scientists and consultants had agreed on the the OMP without consulting them, and they opposed an inflexible formula that ignored such external factors as economics. Even the most pessimistic view in 2002’s OMP showed the hake stock in good condition, albeit below BMSY. It suggested that even catches of 200 000 tonnes could allow the stock to rise above BMSY. There seemed no concern that the stock would be at any risk should this OMP be followed. One year later, however, the trajectories in the 2003 updated assessment (Rademeyer and Butterworth, unpublished report 2003a: 8, Figure 1) suggested that the resource would fall below its 1990 level, the year believed to have had the all-time lowest stock. The model showed the resource in poor condition (B/K ≈ 0.2), far weaker than in the assessment on which the OMP had been based. Nonetheless, as the assessment was within its 95% confidence intervals, the following year’s TAC was still based on the OMP model. In retrospect, even in the absence of the currently available guidelines for “exceptional circumstances”(Rademeyer et al. 2007), advice to management should have prescribed caution. In 2004, the OMP (which had intially predicted that an average catch of 200 000 tonnes could be taken sustainably for the following 20 years) suggested a TAC decrease to 158 000 tonnes. Unfortunately, low exchange rates, high fuel prices and small fish sizes meant that the industry was facing major problems; 2004 was an election year and the industry argued that a decreased TAC would lead to worker retrenchments. Unsurprisingly, scientists were ignored when warning that maintaining the 2003 TAC of 180 000 tonnes would significantly damage the stock. The warnings were justified, however, and the hake stock subsequently fell even further (Kirchner et al. 2012) and subsequent TACs had to be reduced sharply. A hake trawler is a long-lived and ‘lumpy’ item of capital. While the contraction of Namibia’s hake fleet since 2003 (Figure 2) has increased resource rents by removing the least cost-efficient vessels, excess capacity remains a feature of the industry. Not only are some vessels under-utilized, but some right-holders license more vessels than are actually used for fishing. Such unused vessels still incur costs even after their purchase costs have been fully amortized. They also do not use the employees that the right-holders indicated in their motivations for quota, suggesting that the official claim of 10 000 workers in the hake industry may be an overestimate. 2008’s TAC of 130 000 tonnes was captured by 63 vessels with a combined catching capacity of 205 000 tonnes. Some industry members believe that quota allocation is tied to the number of vessels licensed, though this is not the case (personal observation). More realistically, the excess capacity reflects uncertainty about the future of the stock. The inefficiency is a particular feature of the wet-fish fleet—with the exception of three vessels, the freezer fleet operated more efficiently. This indicates the potential for rationalization in the industry; few right-holders have quotas large enough to warrant the individual use of a vessel. Although the smallest wet-fish vessel has a capacity of about 800 tonnes, their mean capacity is 2 700 tonnes, far larger than many right-holders’ quotas. The average individual freezer vessel has a 5 000 tonne capacity; no individual right-holder has this amount of freezer quota. This induces vessel owners to negotiate additional quota, often at great expense. An example shows the situation clearly: in 2012 Tunacor, the fifth largest quota holder, received 4 897 tonnes, well below its 18 000 tonne processing capacity. However, this only provided 30 per cent of the quota that the group used during that year. The remaining 70 per cent (>12 000 metric tonnes) came to it (at a cost) from six associated Namibian right-holders. That there is room for rationalization is clear; how it should be achieved is less obvious. The quota allocation process makes planning difficult for operators. Each new right-holder dilutes the property rights of others and reduces their incentive to fish sustainably. Despite the declining stock and the overcapacity in the industry, all of the rights that expired in 2010 were re-instated and it seems likely that scientists will face increasing pressure to raise the TAC while the Marine Resource Advisory Council’s willingness to accept scientific recommendations will decline. It seems perverse that while rights allocations are not tied to the number of vessels licensed, they are linked to investment, but only for one year. A common argument made by firms is the threat to employment unless they receive additional quota or are relieved of their quota fees. However, allocating additional quota in order to save economically troubled companies simply penalizes viable ones. The State is seen to reward bad business practice and the outcome is a loss of resource rent. Allowing quota tradability would allow non-performing companies to sell their quota, increasing industry efficiency and raising resource rents. Although it is difficult to understand why the quota fees have decreased since 1997, the implications are clear: the State has sacrificed roughly N$630 million in lost fees by ignoring normal economic principles. Many right-holders made no pretence at actual involvement in the industry. While some of Namibia’s long-term rights were allocated by grandfathering, even this is problematic. If the State had been genuinely intent on maximizing rents and acquiring the benefits of the fisheries for the Namibian people, quota could have been auctioned. With freezer quota more profitable than wet-fish, employment and resource rent cannot be maximized simultaneously. Only if the wet-fish sector becomes more profitable can both objectives be satisfied together. The most recent available data (Kirchner 2014, forthcoming) indicated that the freezer sector remains more profitable given current operating costs. Only with substantial consolidation could the wet-fish fleet keep pace with the freezer sector. In South Africa, management procedures (OMPs) are in place for most commercial stocks (Rademeyer et al., 2008) and are accepted by all major stakeholders (industry, scientists and managers). Such broad acceptance was difficult in Namibia for various reasons. In the first place, there was too little initial consultation. As a result, the newly developed procedure was not well understood and not all participants bought into it completely. Secondly, although Namibian industry members ultimately accepted the OMP, few of the marine biologists involved had the strong numerical skills to interpret stock assessment results or the management procedure model based on them. Lastly, socio-economic and political factors impinged on TAC determination and the objectives and performance statistics relevant to it, e.g. interannual catch variation and capped TAC changes. Fisheries managers have multiple objectives, and they value flexibility. Excessive rigidity in the prescriptions of an OMP could be addressed by having it supply a range of TAC options, each with its associated implications, over a number of years (Butterworth 2007), an approach which places the liability for future declines squarely on the shoulders of the decision-maker. Butterworth (2007) states that, when designing an management procedure (MP), care should be taken that the future data needed as input for the TAC-computing algorithm will be both available and of good quality. Even more important is that the original data used in designing the MP be of good quality. The risk is that an MP can give a false sense of security. In Namibia, most candidate OMPs performed reasonably, provided the carrying capacity of the resource had not decreased. However, carrying capacity may indeed have fallen, as hypothesised in the post-1990 assessment which suggested a productivity change between 1985 and 1990 (Rademeyer and Butterworth, unpublished report, 2006). In summary, Namibia was not (and is not yet) ready for a fully structured MP. However, the country’s commercial fisheries need management. The key lesson is that, to be accepted, an OMP’s outputs need to be presented simply and clearly. The simplified approach used in Namibia (TAC is set at 80% of the most recent 5-year average of replacement yield) for the last six years has reduced the time spent haggling to a minimum. This study has argued that resource management can have significant induced or indirect impacts on rents. An example is the loss of resource rents through fleet inefficiency and excess capacity, as shown in the fleet analysis. In the absence of effort controls or permit tradability, rent is easily lost through over-investment in fishing capacity. Nonetheless, the system currently rewards additional investment by increasing the quota of the particular right-holder for the subsequent year. Moreover, the resulting over-capacity is often used to convince the Minister of Fisheries to increase the TAC. It is therefore imperative that not only quotas, but also the number of vessels, should be controlled. The state is sacrificing rents and the system is made inefficient if some right-holders receive (and trade) quotas that exceed their catching capacity, while others are left with underutilised vessels. Unfortunately, the hake industry is both complex and secretive. This lack of transparency precludes rent maximization. At the heart of the problem is the quota allocation process. Some operators expressed a concern that ‘incompetence’ is rewarded and that the current process is at best dubious. Efficiency requires that the process and criteria used be transparent, identified clearly and followed without fail. Some right-holders suggested that the existing criteria should be reviewed and the allocation system made public, while others interpreted the current quota allocation system as a tool to control the industry’s behaviour. This opacity ultimately limits the taxable rents the fishery can generate. Resource rent is maximized when quota goes to the most efficient operators, and formal quota tradability would be a move in this direction. Currently, non-operating quota holders can make immediate riskless profit by simply leasing out their quota; others do so by entering into more formal ‘sleeping’ partnerships. The de facto tradability of hake permit means that the right to issue it may become a source of patronage, and the resulting rent-seeking may impinge on the industry’s efficiency. The recently extended invitation for additional applications for rights increased concern for the industry’s and the resource’s futures. Sumaila (2010) cautions against the dilution of the quota allocation, stressing the fact that ownership of the quota should be concentrated to the fishers and not to owners who are not fishing operators in order for the stewardship of the resource to become effective. An increase in the number of right-holders will decrease some or all the current right-holders’ portions. However, while such small quota allocations could appear as mere patronage, allowing them to be ‘leased’ to the highest bidder could at least increase efficiency since the most profitable processing plants are those able to pay the highest prices. The hake sector enjoys economies of scale, but requires skills and capital to be profitable. With full transferability, quota holdings will be aggregated until only a few large and efficient operators are left, any remaining right-holders being paper quota-holders with no significant investment in the industry. The counterpoint to this argument is that some non-quota holders have been paying unaffordable prices for quotas just to stay in business, hoping that the industry or the resource will turn around. Their debts have been increasing, some have failed, and more seem likely to do so. Such failures have imposed costs on Namibia’s banks, since an operator without formally tradable quota has few useful assets. Given existing excess capacity in the industry, the demand for vessels and other large-scale ostensibly ‘high value’ assets from bankrupt enterprises remains limited. The policy of quota apportionment by vessel type remains contentious, especially as a large proportion of (apparently more profitable) freezer vessel products are exported for further value-adding. It can be argued justifiably that such value should be added in Namibia. While the present study concurred with Sumaila (2000) that the wet-fish sector could potentially be the more profitable, our concerns about data validity suggest caution in respect of this view, especially given the opposing empirical observations presented by Japp and Steenkamp (2004) and Eide et al. (2003). Nonetheless, it is clear that the wet-fish sector has become more organized, efficient and streamlined since 2003, and some processing plants have found innovative ways to increase profitability. It is up to the fishing industry and MFMR to identify further ways to streamline operations. The key driver of rent losses in Namibia’s hake fishery is undoubtedly the depressed resource stock. Less certain is the cause: is it merely excess effort or are there broader ecosystem causes? Hake is a predator whose primary prey, sardine (Sardinops ocellatus), is currently severely depleted. This is likely to limit the recovery of the hake stock. A more nuanced policy question is therefore whether to advocate a temporary closure or TAC reduction in the sardine/anchovy fishery. What is the way forward? The hake resource is a public asset, hence such public concerns as social and ecosystem sustainability should carry weight in its management. Bromley (2009) suggested that the economic crash of 2008 showed just how important it is that a state should not abdicate its responsibilities to a self-interested private sector. However, in a world of stable politics, secure property rights and naturally monopolistic fisheries, it would be easy to agree with Arnason (2008) that the state should simply allocate long-term rights and leave quota holders to take over the complete management of the resource, including the costs of doing research. Such firms would have a long-term interest in maximizing the present value of the stream of net income from the resource, and would have an incentive to manage the resource well. Further, the data used in the economic evaluation would be far more available and reliable. They would also be responsible for the monitoring and surveillance of the fishing behaviour. The idea is appealing, but the stability and security it needs may still be some way off. aThese rights take the form of individual quotas or permit allocated by species. bBetween 1990 and 2012, the N$/USD exchange rate averaged 6.8100 peaking at 11.61 in January 2002.
c These levies are far lower than those in, for example, Iceland, which charges 9% of net landed value. dIn a world of stochastically variable stocks, it is only as a season progresses that decision-makers can determine whether their anticipations of the resource stock were justified. (Weitzman 2002) makes the strong point that it is therefore the escapement, not the catch that one wants to control. When CPUE is low the state should therefore encourage firms not to land their quota; by contrast the present system penalizes those who do so. eWet-fish quota provides 72.7 jobs per 1000 tonnes, 21.2 persons per 1000 tonnes on the vessels and 51.5 persons per 1000 tonnes in the processing plants. Freezer vessels only employ 17.2 people per 1000 tonnes. fWe will argue that since 2004 the wet-fish sector has become increasingly streamlined. gFleet capacity was calculated using the industry’s own rule, by multiplying the Horse Power by two for wet-fish vessels and by two and a half for freezer vessels. hB/K refers to the biomass of the hake aged 2 and above (corresponding roughly to lengths greater than 35 cm, i.e. the fishable biomass) expressed as a proportion of the corresponding pristine (pre-exploitation) level. In a simple Shaefer model the sustainable harvest (surplus production) is rBt (1-Bt/K) where r is the population growth rate. Catchability (q) measures the ‘gear efficiency’ of the survey vessel, i.e. it is the link between CPUE and the stock of fish. We hereby thank the Ministry of Fisheries in Namibia and the Namibian hake fishing industry members for providing the data on which this study is based. We also warmly thank the Confederation of the Namibian Fishing Association for financially supporting this work. Ministry of Fisheries and Marine Resources. 1991. Towards Responsible Development of the Fisheries Sector. White Paper of the Ministry of Fisheries and Marine Resources Namibia. Ministry of Fisheries and Marine Resources. 1992. Sea Fisheries Act (14 of 1992). Government Gazette, Republic of Namibia. Ministry of Fisheries and Marine Resources. 1993. “Announcement of Period during which applications for rights of exploitation under the Sea Fisheries Act, 1992 may be made.” Government Gazette No 679 (30 July 1993): 1–5. Government of the Republic of Namibia. Ministry of Fisheries and Marine Resources. 1997. Proceedings of an International Workshop on the Research and Management of Hake in Namibian Waters, Swakopmund, October 1997. Unpublished report, Ministry of Fisheries and Marine Resources, Namibia. Ministry of Fisheries and Marine Resources. 2000. Marine Resources Act 27 of 2000. CK conducted the initial surveys and compiled the primary analysis, AL contributed to the literature survey and drafted the manuscript. All authors read and approved the final manuscript.